This is an example of one of the earliest oaths of office we’ve discovered of an elected official in Schaumburg Township during the period of 1857 to 1910. This particular one is sworn and signed by Conrad Kolling who was elected Highway Commissioner for Schaumburg Township in 1857. Of particular interest and to comply with the requirements of the 1848 Illinois Constitution note that more than half of the oath serves as an affidavit that he had never fought in, sent or accepted a challenge to fight to the death in a duel. Further, that he in no way participated as a second, aided or assisted either party in a duel. By 1870, the Illinois Constitution specified that the oath of office for an elected official only require the individual to uphold the U.S. and Illinois Constitutions. Front Row: From left to right - Herb Menke, Albert Botterman, Raymond Nebel and Theodore Vass. 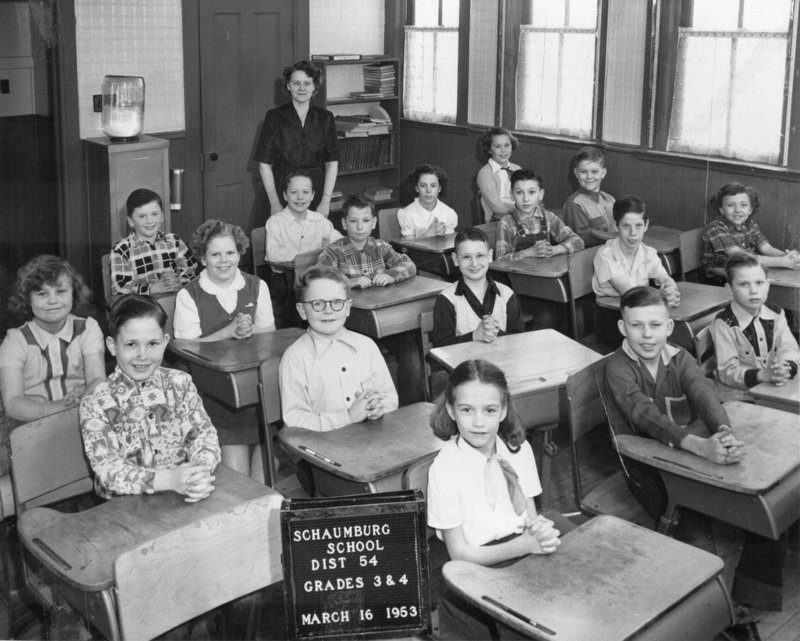 Middle Row: From left to right - Two unknown students, Arthur “Cat” Menke, an unknown student and Loretta Feng. 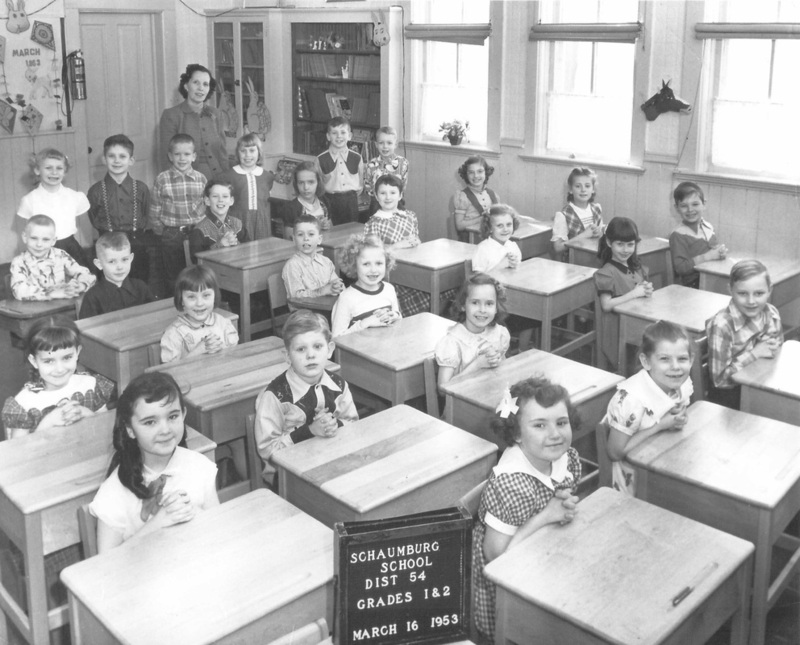 Back Row: From left to right - Three unknown students, Miss McCory the teacher and an unknown individual. Marilyn Carlson, unknown student and George Berberick. Billy Bowser, unknown student, Carla Potts and unknown student. Third Row: Seated front to back - Myrtle Olson, Billy Engler, Brian Knutson and four unknown students. Fourth Row: Seated front to back - Denny Christianson, unknown student, Don Christenson, Diane Knutson and two unknown students. Standing - Anne Fox the teacher. First Row: Seated front to back - Janet Welton and unknown student. Third Row: Seated front to back - Geraldine Mensching, Linda Mahometa, Ruth Lichtardt, Ken Carlson and unknown student. Fifth Row: Seated front to back - John Palumbo and two unknown students behind him. 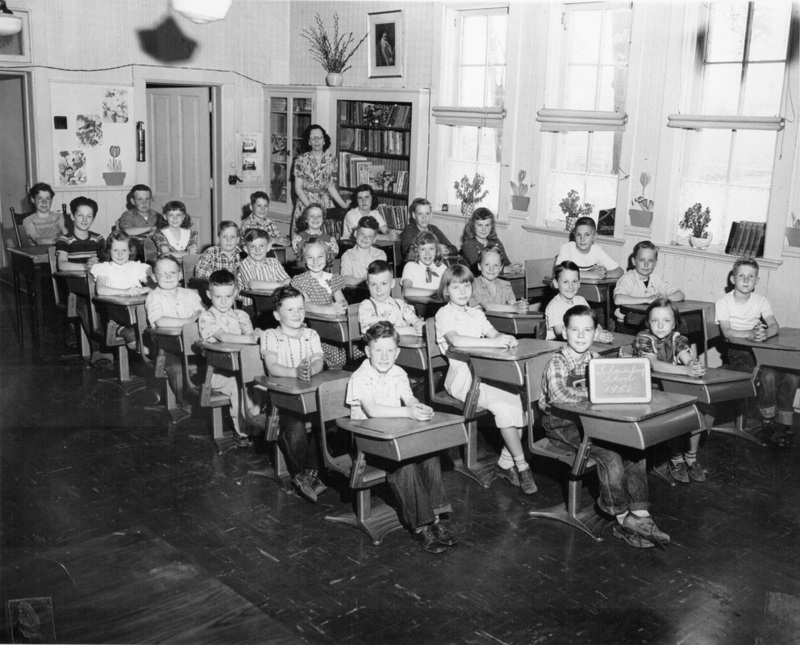 First Row: Seated front to back - two unknown students. Second Row: Seated front to back - unknown student, Bruce Knutson, unknown student and John Gaza. Third Row: Seated front to back - Harold Wiese, Billy Engler, John Becker and unknown student. Fourth Row: Seated front to back - Jimmy Garbrecht, Bob Nelson, Gary Campbell and unknown student. Fifth Row: Seated front to back - Myrtle Olson, Eddie Mossman and Carol Bierman. Standing - Hazel Lundsman the teacher.